Can You Cure IBS Permanently? Home » Blog » Uncategorized » Can You Cure IBS Permanently? Millions of Americans experience irritable bowel syndrome (IBS) at some point. IBS is incredibly common, with up to one in five Americans suffering from it during their lifetime. But due to the personal and embarrassing nature of the syndrome, too many people “put up with it” and suffer through life in silence. If you’re experiencing chronic abdominal cramps, frequent diarrhea or constipation, and your doctors don’t know what’s causing it—you may have IBS. If you have IBS and are ready to cure it permanently, contact us today. Why Is IBS So Hard to Cure? IBS is challenging to diagnose and treat because the symptoms and causes vary. Unfortunately, in today’s American medical system, many doctors seek a quick one-size-fits-all solution. The complexity of IBS means it takes time and expertise to diagnose and treat. This means many doctors try a few simple solutions, and when they fail, they throw up their hands and tell patients they’ll simply have to live with the symptoms. This medical surrender has given IBS a reputation for being “incurable.” But in fact, IBS is very curable. Thousands of our healthy, cured patients would be happy to confirm that fact. 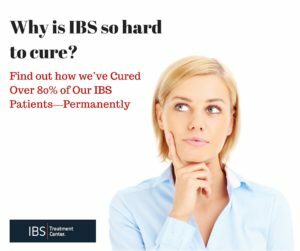 At the IBS Treatment Center, we know it is possible to cure IBS, and our numbers back up this claim: more than 80% of our patients have been successfully and permanently cured, which is the highest success rate of any facility anywhere. We can cure patients because we’re experienced with IBS specifically. We know it takes time and personal attention to work with each patient and identify their triggers and symptoms, and work together to create a personalized wellness plan. We’re invested in our patients’ success. « Does Xifaxan Cure IBS?